PT Petrosea Tbk - Petrosea is a well-established public-listed company in Indonesia, running business in the field of multi-disciplinary mining, oil/gas and infrastructure services. Petrosea has defined the following 3 business pillars, namely Mining Service, Engineering and Construction and Petrosea Offshore Supply Base (POSB). Petrosea was founded in 1972 and initially registered as PT Petrosea International Indonesia. The name of PT Petrosea Tbk officially launched in 1990 after listed on the Stock Exchange (Jakarta Stock Exchange and Surabaya Stock Exchange) with trading code PTRO. As of December 2015, PT Indika Energy Tbk (Indika Energy Group, IDX:INDY) is the majority shareholder at PT Petrosea Tbk, with 69.80% of ownership. Another 10.60% are owned by Lo Kheng Hong, while the rest are owned by general public (19.60%). Petrosea is based in South Tangerang and now has 1 Balikpapan Office and 1 Offshore Supply Base (POSB) at South Balikpapan. 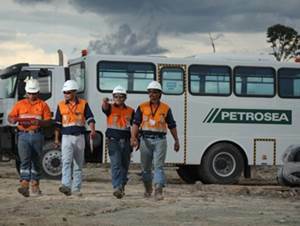 According to PT Petrosea Tbk Annual Report 2015 as cited by JobsCDC.com, Petrosea recorded total revenue of US$ 206.83 millions in the business year of 2015, down 40.56% fromUS$347.97 millions from the same period last year. Petroseas's total operating income in 2015 was down 75.81% year-on-year to US$ 9.73 million from US$ 40.22 millions in 2014. . Minimum high school degree with 7 years or Diploma degree with 5 years experiences in the field of Mechanical Engineering. Minimum 3 years of experiences in Maintenance in mining industry on supervisory role. Have strong understanding about Preventive Maintenance Scheduler for Heavy Equipment Unit. Possess driving license class B2 (SIM B2). Possess qualifications and certification in field of trade or required duties. Have strong understanding of mining requirements and production targets. Have strong understanding of equipment availability and planning of repairs. Strong leadership skill and commitment. Willing to work flexible hours to accomodate job requirements. Willing to attend test at Petrosea Balikpapan. Previous experience in field of work, with minimum 3 years of experience in a leadership role. Possess qualifications and certification in field of trade/required duties, especially for drill machine. Conducts mechanical work to PTP and OEM maintenance standars to help achieve high mechanical availability. Have a good knowledge of heavy equipment maintenance, especially for drill machine. Have a strong understanding of mechanical availability and correct repair and maintenance methods for drill machine. Have a good understanding of mining requirements and production targets. Able to interface with other department in team work environment. JobsCDC.com now available on android device. Download now on Google Play here. Please be aware of recruitment fraud. The entire stage of this selection process is free of charge. PT Petrosea Tbk - SMA, D3 Service Foreman, Maintenance Foreman Petrosea October 2016 will never ask for fees or upfront payments for any purposes during the recruitment process such as transportation and accommodation.